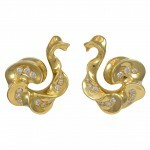 Diamond and 18k yellow gold swan shaped earrings. The diamonds are round brilliant cuts with a total estimated weight of 1.00cts. The earrings are clips.